Eugene O’Daly, an Athlone man, who acted the part of a hero. He fought his way to the boats, and was the means of saving two of his townswomen. He then rushed across the deck and tried with others to launch a canvas boat, but it was held down by a wire stay. The water by this time was washing her decks. He dived overboard. The canvas boat washed free from the deck and Daly and 15 others managed to pull themselves on board it. He states: "As I stood on the boat I saw the ship go down. We thought she would fall over on us, as she seemed to be swinging round. But she did not. There was no suction; our craft was not drawn in at all." 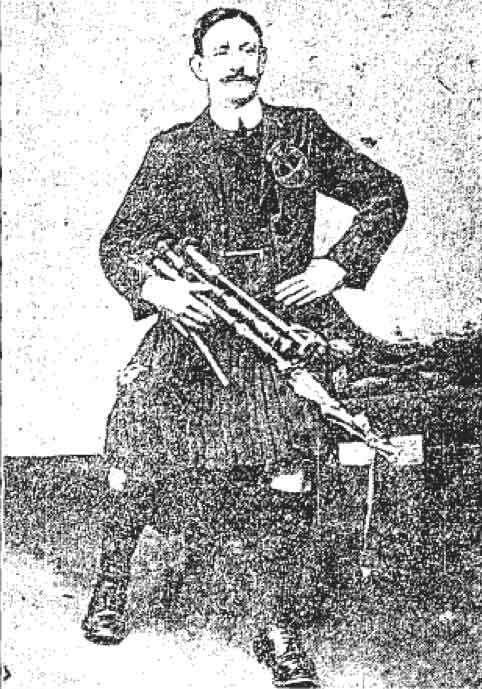 Mr O Daly is a well-known performer on the war-pipes: he had a set with him on the Titanic, and as the tender Ireland on which he left Queenstown, cast off he played up "A Nation Once Again," his performance being received with delight and applause by his fellow travellers. He played many native airs on board the tender, and as the latter moved away from the liner the pipes were heard once more giving forth "A Nation Once Again." Those who were on the tender on that day heard with extreme pleasure of his being amongst the survivors.